HANGAR 45 | 2018 State of the Hangar Address! I thought this would be a good time to get everyone up to speed with where we are at the moment and where we are heading in the future. Hopefully you will be just as excited as I am about the future of our beloved corner of the flight simulation hobby. But before I go on any further I have some very sad news to share. I am sorry to have to pass that news on to you guys. The time is fast approaching that myself and Shane will be leaving law enforcement with more than 25 years of service each and will have ( or should have) an additional 40 hours a week to apply to the sim building business. Additionally, Mark Speechley just retired from his practice and he should also have a little more free time for beta testing the Jet45 AAS and sim building. We are happy to join DonnyRay and Randy, probably working harder than ever before!! For me personally, my last day with the sheriff’s office will be June 27th and at that point, I will be moving full speed into making parts and panels available to our Hangar members. The Hangar45 website has been up and fully operational for a couple months now after many painstaking months of backing up the forums and repopulating the relevant content into the new forums. Our website has been moved back to the 1and1.com server and we are now using WordPress and it’s powerful plugins. Additionally, we are now using a brand new forum engine with all the latest safety features. I am by no means a web designer but over the past six months, I have learned enough to get us by and keep the site running safe from bots and spammers without the use of outside paid help. If any of you see anything that needs to be fixed or changed, please let me know and I will fix it ASAP! 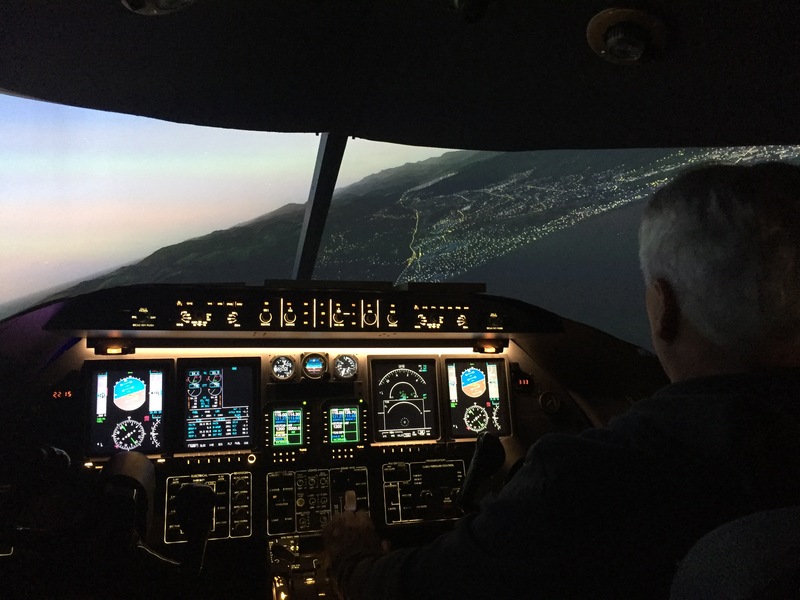 In an effort to keep up with the times, we now have a Facebook page for those of you that like to share relevant flight simulation links and photos of your projects at the touch of your smartphone while on the go. The Facebook page is primarily a social media site where you can easily post a photo with a comment about what’s new with your sim or maybe something that you have recently found that you think others may also be interested in. If you have a more in depth question or are trouble shooting a sim related issue, please post those types of issues in the hangar where we can better address the problem including uploading and downloading files. Our Facebook page is just another way that we can all keep in touch, share information and ideas! For a variety of different reasons, the forum traffic on the hangar has slowed down. But at the same time, I have my fingers on the pulse of our community enthusiasm and know that we are very much alive and well. As an example, I have personally seen Randy’s project and it would blow the rest of you away if you saw it! Same with what DonnyRay is doing. Just these two guys alone and what they are doing would be like throwing jet fuel on an open frame if they made periodic post with some photos every now and then. We have become comfortable emailing each other with photos, updates and what we are currently working on. There are certainly things that need to be kept out of the public eye but there are many things that I have seen that could be shared in our Hangar community. Our open community discussions are one of the many things that fan the flames of desire for the news guys coming on board! Food for thought. The Photobucket saga is now behind us! To refresh your memory, several months ago Photobucket decided out of nowhere to lock everyone out of being able to access their own photos and hold a $400 a year ransom over them. This effected most everyone here at the hangar including millions of folks around the world. After a couple hundred hours, we were able to manually save everyone’s photos that were housed within Photobucket and store them in our own WP Media gallery where it does not cost a penny. So if you happen to still be with Photobucket, you are free to kindly tell them to close your account if you wish. There are instruction on how to post photos on the “About Hangar45” page in the hangar. In the end, it is no longer necessary to use a third party photo hosting website but if you still wish to, we recommend ImageShack at about $39 a year or GooglePhoto which is currently free. Over the years I have said to many of you that when I get to this point in my law enforcement career (the end of it), I will be taking on more of the panel building to help supply products to our members. In short, I will be redesigning every panel I currently offer and design panels I have not yet supplied to cover 100% of the Lear45 cockpit. This is another monumental task but will pay huge dividends over the long haul! In addition to making 100% of all the panels available for sale, I will be making 90% of my drawings and G Code public on a dedicated page in the hangar so that anyone who is a registered logged in member can download them and build there own panels if they have a CNC, a little knowledge of how to run it and some time. This plan is to help foster a club atmosphere, relieve pressure off of the few panel suppliers that we have including myself and to allow the DIY hangar members a clear and confident path to building their own parts and panels at their own leisure. This path will also attract countless new Lear45 builders that might have chose another airframe to model. This is going to be very exciting and should be fully implemented by January 2019! Speaking of redesigning, I have my sim completely taken apart as I am redesigning everything to get even closer to 100% scale. Before I go any further, don’t worry, most of these changes are small movements and are mostly to help the manufacturing, assembly and maintenance processes go a little smoother. Before and after photos will not reveal any obvious changes but there will be some. Some of the biggest changes can be credited to DonnyRay due to his research while designing his own MIP and GS which will be populated with a high percentage of real avionics. The new design work will include an 18 degree MIP with a double 18 degree bend in the GS, almost identical to the way the real GS is built. Again, the amount of change which is minimal for the amount of work and money is not going to be worth the effort for most current builders. These changes are more for the new guys coming on line and for the one or two guys who can’t stand knowing there is something more correct available. You know who you are! Additionally, I will also be revisiting the Project45 Shell design to make a few minor changes. The overall dimension will not be changing. The changes will be correcting a small compound curve under the forward windscreen. Again, these changes are not going to be noticeable to the casual observer and will only be for future sim builders. Another major change that we will be implementing into the design as an option will be the use of mechanical standby gauges to replace the center LCD screen in portrait mode. This will of course give us the appearance of three real standby gauges that will look more the part especially in cold and dark state. The center LCD will be replaced with a smaller LCD screen in landscape mode for just the two RMUs which will solve the issue of viewing the RMU screens at extreme angles. This modification will also give us more room behind the MIP for the Crew Warning Panel wiring. Additionally, the overhead compass and the two AOA gauges on the MIP will be available by Flightillusions. These are all optional and the center LCD screen in portrait mode will still be a valid option in the future if you do not want to go the more expensive route. We are also in talks with a well known flight modeling vendor in an effort to see if we can encourage them to take on the Lear45 to add to their list of incredible aircraft models. We can’t elaborate any further than this so that we don’t get everyone’s hopes up but so far it seems to be very promising. One of the areas that we have been left with a huge hole is the TQ module. In the beginning, we had access to the real Lear45 TQ levers and parts, but after about eight sets made their way into our hands, the supply dried up. Then Mark L. stepped up and made several incredible TQ module replicas. But unfortunately, Mark has stopped production of his product. Last year, Maciej took the leap of faith and purchased a TQ module from an unknown vendor from somewhere in Europe. Although this TQ looks great, it is at best a static display. Maciej has sent this unit to me and I am in the process of redesigning it and salvaging what I can. What I have concluded is that by the time I am finished, Maciej will be receiving two TQ modules. A brand new fully functional TQ module from myself and the one from Europe but in the form of a box of parts. With all this said, I will be designing and making an all new TQ module and making it available for sale. Additionally, this design will be available as drawings and G Code for the guys who want to take it on themselves. On the software front, Jason Hite is getting ready to release a new version, 1.0.0.7 with many new and exciting changes. One of the biggest things that he is working on is a better way to interface our physical hardware to our computers. One of the solutions to this is the exclusive use of Arduino interface cards which are cheap, use powerful software and in some cases are more effective than our current interface solutions. Additionally, Jason is working on future development that will remove the need for FSUIPC offsets. We all know this but I will say it every chance I get, Jason and his software is hands down the most vital aspect of our projects. Without Jason we are flying with PM Suites. If you are building a Lear45 flight simulator, you need to purchase the Jet45 AAS and the FMS software packages! They are a must have with this project! We are at a pivotal point in the evolution of Hangar45 and our projects. As you can see from the information I have outlined above, we are pointing the forward movement of the hangar in a direction where our members and their needs come first. We have guys that like building as much as they can on their own and we have other guys that like to buy parts and panels from guys who are making things available. This October will mark our 10th year anniversary since the inception of Hangar45.net. So my hopes are that for our 10th year anniversary, we will be in a better position to accommodate our “Do It Yourselfers” and our “Buyer Plug and Players” alike. Previous Post: Flightdecksoft Products on Sale! Next Post: Hangar45 turns 10 years old this month!